Just up the street from the Jade Museum in San José, there’s a Chinese-style roof displaying a large gold and red sign with a glaring typo: there’s no “t” at the end of the word “restaurant.” I guess it makes sense, as a Tico would probably say Restauran Wong’s if they’re speaking in English. The same happens when Ticos say my name. I am often Willian. Maybe I’m easy to humor, but there is something I enjoy about the restauran sign. It’s the perfect misinterpretation of English, Costa Rica and Chinese. It’s a giant gold letter literally lost in translation. The food is just Chinese, though. And it’s authentic. 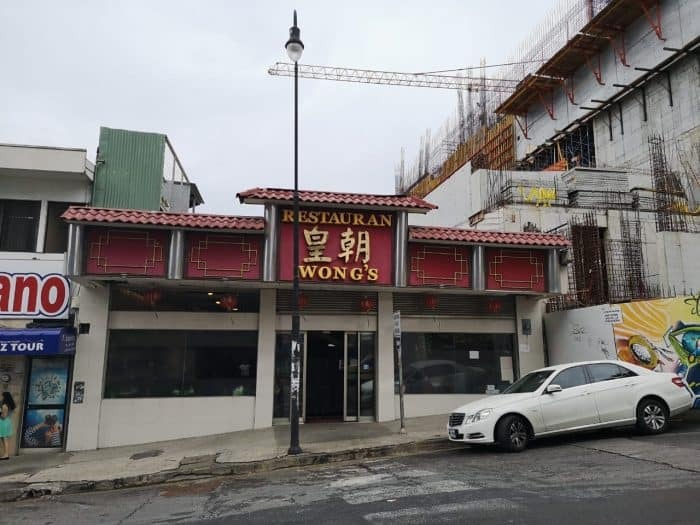 Wong’s is a large, traditional style Chinese restaurant, that has been open for more than 10 years in the heart of San José. It’s located on Avenida Central, just west of Calle 15, and just across from la Plaza de la Democracia. This place is the Mecca for dim sum in Costa Rica. Dim sum is a light style of Chinese appetizer or share plate. 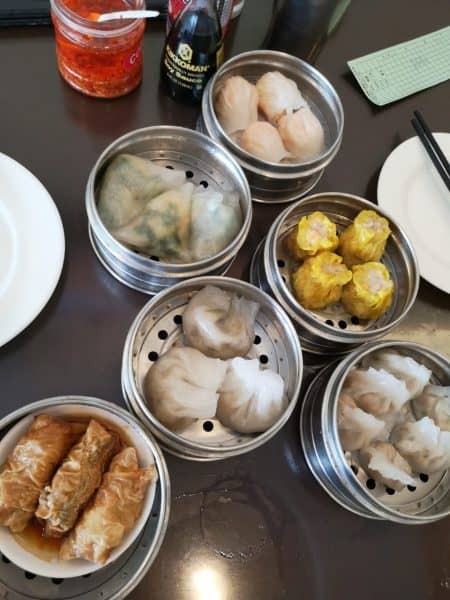 This idea is to order an assortment of different dim sum dishes —that usually come with 3 or 4 portions apiece— and share them amongst the table. This way you get to try a wider selection of food, which I am a fan of, and you are guaranteed to leave with a full stomach – because if you’re not full yet, you just keep ordering more. The dim sum menu at Wong’s is a simple, one page, double-sided document with 40 different plates that are mostly dumplings. Thankfully, the most popular ones include a photo, which makes ordering a little easier. Don’t be shy to ask the waiter for recommendations, either. If you are, I can just tell you what to order. Try #20 Siumai, #9 shrimp and vegetable empanadas, #12 shrimp and celery empanadas, #21 rice soup, #2 steamed pork bun, #7 pork roll or #28 pork and peanut empanadas. 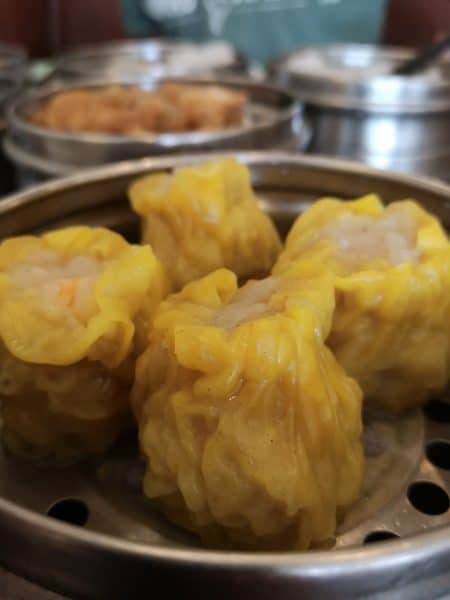 Shumai is one of the most popular dim sum items in the world. At Wong’s it’s a mix of pork, chives and ginger, wrapped in some sort of thin wonton-like dough before steaming. The shrimp empanadas are perhaps self-explanatory. They’re empanadas stuffed with shrimp. The differences is that #9 comes with chives while #12 comes with celery. Number 21 is a rice soup called congee. It’s China’s version of porridge, made with rice instead of rolled oats or wheat. You can add different meats and garnishes to it. Personally, I like to add some scallions and fresh ginger to mine, along with soy sauce and even a tiny bit of sesame oil. Request some if need be. Number 2 is a sort of bread-like bun, stuffed with BBQ pork. Number 7 is ground pork meat, rolled up in what I believe is some sort of tofu wrapped. Finally, #28 is another empanada, but filled with pork, instead of shrimp. All of these are steamed. It makes them light and easy to keep eating. Almost too easy. Most of them actually taste quite similar, especially as the ones I prefer to order always seem to be the pork and shrimp based option, but don’t be scared of a little repetition. It tastes so good that you won’t mind. During peak hours, they will have most of these already prepared, hot and ready to serve off of a traditional cart that they roll around the dining room. If not, they will order it from the kitchen for you. The cart is ideal though, as it makes it very quick and easy to keep ordering more and more. It makes for a real feast. Each plate is served in their steamer basket and everyone prepares their own empty plate with a mix of soy sauce and spicy vinegar to dip the dim sum. 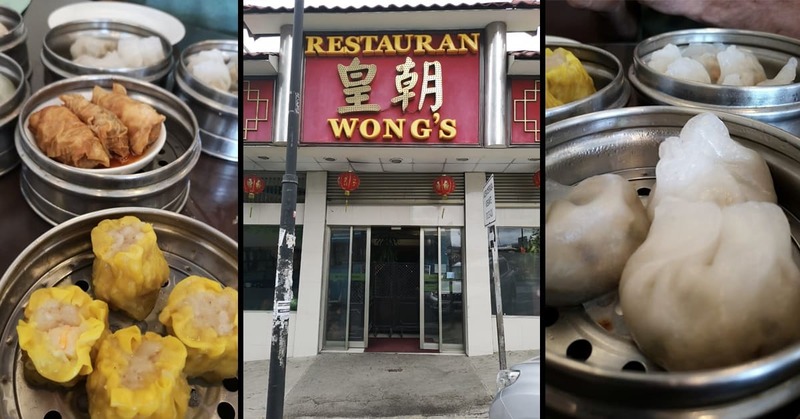 In China, they usually eat dim sum for breakfast, brunch, or early lunch; but at Wong’s they serve for as long as they’re open. So why not break the rules? I have ordered dim sum at midnight on several occasions. At that time of night, the one-litre bottles of Tsingtao beer are the perfect accompaniment. Served over ice, they seem to drain as quickly as a regular size bottle of beer would. But that’s OK, we’re breaking the tradition. 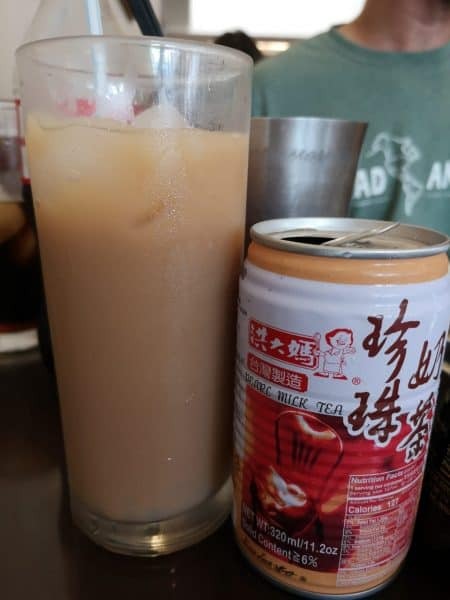 Or, if you’re having lunch, maybe grab a can of their milk tea with tapioca pearls. Aside from their dim sum menu, Wong’s also has a lunch buffet available, we well as an eight-page “a la carte” menu featuring the greatest hits of Chinese cuisine. I’m talking about egg rolls, wontons, soups, fried rice, and stir fries with different meats and seafood. They also offer a great selection of dishes where tofu and vegetables are the focus. So Wong’s is definitely a vegetarian-friendly option. I am a creature of habit and have not tried anything off of their main menu. For me, their dim sum feast reigns supreme. The dim sum always arrives quickly and you never have to wait long to be seated either. While the upstairs and downstairs seating can easily fit 150 people, the restaurant does fill up, especially during lunch and late at night. Many of their tables are large too, so this is a great option for groups of more than 10. Instead, look for Parqueo Publico La Paz, which is around the corner, only 100 meters away. There are other pay parking lots in the area, but Wong’s customers are entitled to a free hour of parking at La Paz. Just make sure that when you are paying for your meal at the counter, to get their staff to stamp your parking ticket before you leave the restaurant. Search “Restaurante Wong’s” in Uber or Waze to arrive conveniently. *As of Nov. 23, 2018. We’ll keep you updated when they open back up. William Ayre is a Canadian born chef and restaurateur who has spent the last half of his life doing business in Costa Rica, where he now considers to be home. Inspired by Anthony Bourdain, Ayre’s passion of experiencing different cultures through food has taken him to 35 different countries over five continents. Whether it’s a 20-course meal at a fine dining restaurant in Toronto, or cantina hopping in search for the best chifrijo here in San José, he fits in just fine.